The University of Maine Black Bears Sports Teams had a very busy weekend! The Men's Baseball team got their season started at UNLV Friday with a hard fought 4 - 2 loss. They followed that up with a double header loss on Saturday, again playing solid baseball, dropping the opener 9 - 5 and dropping the nightcap 4 - 3 after taking a 3 - 2 lead in the top of the 9th. The Women's Softball team blasted Coastal Carolina 9 - 0 Saturday. The Men's Hockey team dropped another hard fought game to UMass Lowell 4 - 3. Maine was down 4 - 0 entering the 3rd period and stormed back with 3 unanswered goals, but could not pull off the game tying goal. The Women's Basketball team had a tough game Saturday, losing to Binghamton 66 - 46. 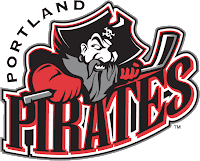 The Portland Pirates wasted an outstanding performance from Goalie Jhonas Enroth , who had 43 saves, losing to the Hartford Wolf Pack 2 - 1 in OT.